In 2015, the government of India set out on a mission to “Double Farmers’ Income by 2022", when the nation completes 75 years of its independence—an ambitious yet necessary goal for the company, given the pre-eminence of agriculture to our economy. It is, therefore, imperative that our nation’s food security becomes a mainstream subject. To this end, the YES Bank Transformation Series, India’s largest B-school innovation challenge, partnered with the Atal Innovation Mission (AIM), NITI Aayog. AIM put together an agri-tech focused challenge to double farmers’ income by 2022 for the finalists of the transformation series, who were selected from among more than 30,000 students worldwide. In line with the government’s national mission of transforming India into a “smart agri-nation", when the best and the brightest apply their minds to this key challenge, innovation will happen. The grand finale witnessed 41 students from 15 top business schools across India setting out on this national challenge, and presenting their innovative solutions to a power-packed jury, chaired by Ramanan Ramanathan, mission director at AIM. Starting out in 2010 as a platform for bright young minds from India’s finest B-schools to work on real-world business challenges, YES Bank Transformation Series has now established itself as India’s largest case study challenge. In its sixth edition, the series is now among the leading global crowdsourcing platforms for solutions to live challenges, in conjunction with various national and global partner organization across key sectors. As Rana Kapoor, managing director and chief executive of YES Bank, said: “The Indian economy is witnessing a crucial phase characterized by design, innovation and creativity led entrepreneurship, against the backdrop of supportive government policies and favourable demographics. At YES Bank, it is our constant endeavour to engage with our nation’s youth and channel their entrepreneurial spirit into the right direction, with an emphasis on design thinking and innovation. The YES Bank Transformation Series presents a unique opportunity for students to provide innovative solutions to real world challenges facing India Inc., by allowing them to take up the role of business leaders. The partnership with Atal Innovation Mission, NITI Aayog, provided young innovators a golden opportunity to be part of a national challenge. I am confident that through this initiative, we will continue to discover India’s next big innovators." Amitabh Kant, CEO of NITI Aayog, said, “NITI Aayog is focused on identifying National Transformation Ideas and Initiatives for the government of India, initiatives that would enable sustainable job creation and ensure a position of leadership for India in the knowledge-based economy that is sweeping the world. Technologies such as IoT (internet of things), Big Data, drone farming, precision agri techniques will be the key differentiators in charting the roadmap for Smart-Agri Nation. NITI’s Aayog’s vision is to accelerate the adoption of such technologies for the growth of farmer incomes as well as job creations. In this regard, YES Bank Transformation Series provides an ideal opportunity to the brightest minds of the country to collaborate, co-innovate solutions which address the challenges of national importance. We look forward to continue our association with such initiatives in the near future." In this edition of YES Bank Transformation Series, the preliminary rounds had students pick a unique challenge from among three areas: smart cities that are being set up across the country; financial technology (fintech), which is redefining the financial services industry; and social entrepreneurship. The case challenges for smart cities were shared by global technology leaders Cisco Systems Inc., International Business Machines Corp., Microsoft Corp., as well as Nasscom—India’s apex IT industry association. For fintech, the students had the opportunity to work with four fintech innovators, Morph.ai, RedCarpet, Numberz and Rupeeseed. On social sector entrepreneurship, the live cases were provided by Singapore International Foundation and Intellecap, a leading development sector consulting firm. Given the need for innovation in these sectors and their potential to pollinate transformation of the economy, the challenges in the preliminary rounds witnessed overwhelming participation from across top business schools, including Indian Institute of Management (IIM) Ahmedabad, IIM Bangalore, IIM Calcutta, IIM Lucknow, IIM Indore, Indian School of Business (ISB Hyderabad), Indian Institute of Foreign Trade (IIFT), National Institute of Industrial Engineering (NITIE), IIM Shillong among others. The top 15 teams were then shortlisted through an exhaustive evaluation process across the preliminary and campus rounds. This year, the competition engaged with 500,000-plus students from around the world through the case challenges, as well as “Transformation Series Hack", a social media-driven engagement initiative for students to share their ideas on pressing national and business challenges. The YES Bank Transformation Series 2017 was a rigorous affair, having run for almost 100 days before coming down to the last few hours of the grand finale on 9 November. The grand finale started with the Top 15 teams pitching their solutions to the jury and responding to questions from various jury members. After an intensive round of presentations, the spotlight moved to the jury. Picking the winning solutions from the 15 disruptive ideas was indeed a challenge for the jury, but after some deliberation, the winners were finally decided. Setting things into motion for the awards ceremony, Ashok Chawla, chairman of The Energy and Resources Institute and a veteran in the financial services sector, highlighted the importance of the platform as a chance for students to fine tune their ideas through interactions with industry and policymakers—a rare collaboration through the YES Bank Transformation Series. AIM, NITI Aayog had given the country’s brightest minds the challenge to make India a “Smart Agri Nation" by devising agri-tech strategy to double farmers’ income by 2022. Right from strategizing the procuring of technology to its implementation in the farms, the students worked on a detailed business plan. The solutions presented by the top 15 teams were spread across diverse domains, such as drone-based farming, crop analytics, soil card, smart sensors. AIM’s Ramanathan said, “The teams presented fresh ideas and provided some unique solutions such as drone-based farming, platforms made with the help of sensors, IoT which can be taken forward and implemented." Team Easy Company from IIM Shillong beat team Dreamers from IIM Bangalore and team Unravellers from ISB Hyderabad to emerge as winners of the YES Bank Transformation Series 2017. “Transformation Series is a battlefield where the best of our intellect is tested to the core. While there are many memories in my MBA Life, Transformation Series takes the Golden Spot, for it has helped me realize what I am capable of. Being the global winner of the sixth edition is one of the highest point in my MBA career," said Anirudh Jain, a member of the winning team, which also included Anshul Mishr. Rana Kapoor managing director and CEO, YES Bank. At YES Bank, it is our constant endeavour to engage with our nation’s youth and channel their entrepreneurial spirit into the right direction, with an emphasis on design thinking and innovation.- Rana Kapoor, managing director and CEO, Yes Bank. The winners received Rs5 lakh and a pre-placement interview (PPI) with YES Bank, the runner-up IIM Bangalore got Rs3 lakh and a PPI, the second runner-up ISB Hyderabad won Rs2 lakh and a PPI with the bank. “The culmination of Transformation Series marked the coming of age in my journey of being the next age innovator. 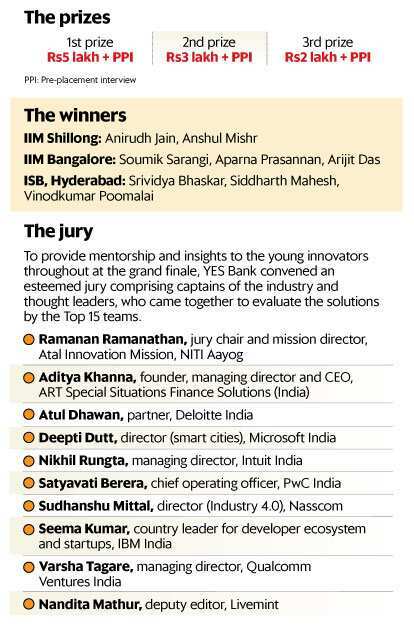 The mentorship provided by industry experts; especially the jury along with YES Bank team really helped me in taking my solutions to the next level and brought me one step closer to my interaction with live world problems,"said Aparna Prasannan, one of the members of a three-person runner-up team from IIM Bangalore the Dreamers. “It was a phenomenal experience right from the time we started working on the case to the time we were crowned as the winner. Our campus was assigned a mentor who helped us anytime we had a query regarding the competition. The panel of judges made sure we had clarity about the ideas we were presenting for it to be feasible," said Siddharth Mahesh, one of the members of the second runner-up Team Unravellers from ISB Hyderabad. The other two member are Srividya Bhaskar and Vinodkumar Poomalai. Jury member Aditya Khanna, founder, managing director and CEO of ART Special Situations Finance, said: “YES Bank Transformation Series is an attempt towards nurturing and promoting talent inherent in the brightest young minds of our country. It also aims in infusing the spirit of DICE— Design, Innovation and Creativity led Entrepreneurship in them." “Krishi Sahayak Jholi", a product-service ecosystem, which employs the use of smart soil sensors and local language manual to provide integrated pest management and ecological forecasting. The team aims to develop a sensor-enabled modular farm, capable of diagnostics, predictive and prescriptive analysis reports to highlight any anomalies along with recommended corrective measures. The harvest produced would be stored in GrainPro cocoon (an innovative solution for the long- term storage of agricultural commodities worldwide. The cocoon is originally designed for multiple indoor or outdoor use and is priced accordingly), and with the help of optimized third-party logistics, distributed to the markets. The solution passes the three key tests of feasibility, scalability and ease of implementation. It focuses on providing implementation guidelines at ground level. Benefits such as real-time soil moisture monitoring, crop yield analysis and field monitoring were highlighted by the jury. Aarohan, a drip irrigation system operated by solar power and controlled by a microcontroller with a holistic deployment strategy. By segmenting different regions in India based on rainfall distribution, a suitable technology that will have maximum impact will be deployed for each region. It will have an enterprise resource planning platform at the state level and a variant at the district level developed by an outsourced IT service provider, which will consist of crop health monitoring, tracking climatic changes, planting density changes and forecasting modules. The most striking feature is the presence of farmer representations from the grass-roots level to the state level. The solution is suitable for areas where water availability is marginal, as well as the terrain is sloping and undulating. SPIDI (solar powered intelligent drip irrigation) system can also have an enormous impact in states such as Punjab, where irrigated agriculture is consistently depleting groundwater table. The unique technology transfer unit (TTU) concept, where one TTU per 25 villages will be present to provide customized solutions, will result in conservation of water by up to 70% and increase in farmers’ income by 22%. “Smart Kisan Platform", a guided decision system to improve total income for small/marginal farmers using connected technology. The system consists of Internet of Things-based SIM (subscriber identity module) card-enabled network sensors that collects data regarding moisture, nutrients and fertility levels of the soil. This information is then relayed back to the farmers, and allows them to make informed decisions about which portfolio of crops to grow. Presence of a unique system integrator that will work as the data aggregator as well as data processor in order to analyse the data gathered by the sensors present in the soil. Due to the sensors being SIM card-enabled, farmers will be able to get direct access to the analysis done by the system integrator on their feature/smartphones. The platform is highly user friendly with an intuitive user interface.